Motivate your students to practice reading and language skills! Help your grade 3 students practice and reinforce reading and language skills using the delightful, highly-motivating centers in Take It to Your Seat Reading and Language Centers, Grade 3. 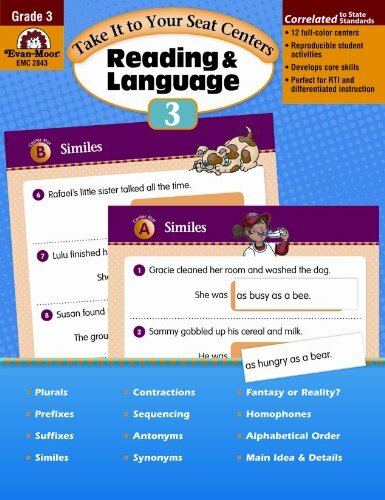 12 full-color centers cover the following standards-correlated skills: Contractions Match-Up, Sequencing, Fantasy or Reality?, Antonyms, Synonyms, Homophones, Plurals, Alphabetical Order, Main Idea and Details, Prefixes, Suffixes, and Similes. View More In Chapter Books & Readers.